2017 brought its share of challenges and opportunities when it comes to the energy code and its enforcement. The “fun” will likely continue in the year ahead. Last September, the mayor announced that the current energy code would retroactively hit existing buildings over a certain size, forcing their owners to upgrade the properties as a matter of law. Similar to Local Law 26 of 2004, which mandated equipping all office buildings over 100’ tall with sprinkler systems by 2019, the energy code may get likewise treatment this year. With tighter rules comes more stringent enforcement. Mark my words, the era when energy compliance inspections were only handled by special inspecting RAs or PEs retained by ownership is over. The Department of Buildings (DOB) Sustainability Enforcement Unit (SEU) is now also responsible for making sure job sites stick to the energy code. The SEU isn’t necessarily all new. About a year ago, rumors started circulating around the industry about surprise DOB energy inspections. Since then, SEU has appeared to increase its work scope, and the industry now pays prompt attention. SEU inspections are a potentially big deal because they counter standard industry practice. Typically, energy inspections are handled by third-party inspectors, or the RAs or PEs who are responsible for work shown on their plans. Essentially, ownership retains these individuals to ensure that what is built in field meets the approved plans. However, “approved” plans change. While the individuals aware of and involved with the job are apprised of such changes, DOB may not be informed until the final project stages—when DOB construction inspections may be called for. Most of this is done in part to save the design and construction team hassle, as it’s easier for an architect to issue a simple sketch that shows a new field condition than to revise the entire set, file the requisite paperwork, get a DOB examiner to approve the plans (or self-certify the plans themselves), and get a Post-Approval Amendment drawing set issued. This time-saving technique wasn’t an issue when DOB inspectors were reviewing finalized construction conditions or work in progress done by a specific trade (plumbing for example). But when a minor envelope detail changes that is not reflected in the approved set or its analysis, bad things may ensue upon inspection. To play it safe and minimize inspection risk, details—which energy examiners are tasked with approving—must be revised prior to work in field. While these amendments are usually simple plan changes that don’t require administrative changes in DOB’s project file, asking lead plan examiners to approve minor detail changes not typically in their remit may cause confusion. DOB has gotten better about plan exam turnaround, but it still takes a few weeks to secure approval from two different plan examiners. 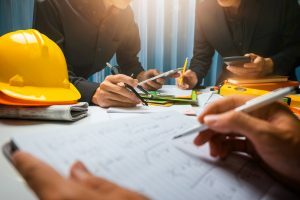 As a result, contractors should work with design consultants sooner rather than later on any design changes that affect energy code compliance.